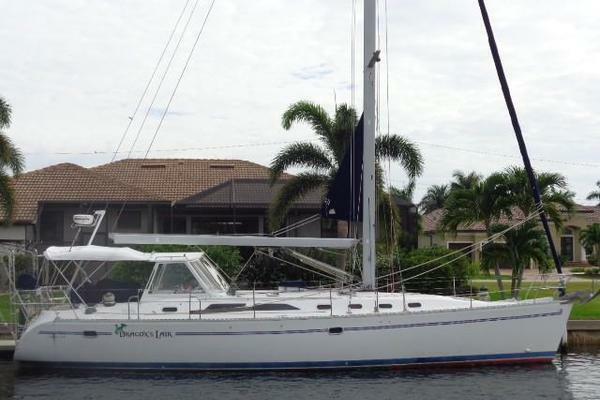 GALENA II was built by an experienced sailor for extended cruising in comfort and safety. Sail handling has been optimized for performance and simplicity for short handed sailing with a carbon fiber mast, Leisurefurl boom and all lines led back to the protection of the cockpit . Her exterior is simple and well thought out and features a custom hard dodger and stainless antenna arch. The ergonomic cockpit transitions to the beautiful interior down three steps. The raised salon area over the galley and nav station provides abundant light and visibility with a comfortable dinette forward of the galley. Her two cabin, two head layout provides ample storage and tankage. Well-equipped and maintained, she is in the water and ready to go. One of the best of Chuck Paine’s Bermuda Series, the Morris Ocean Series 48 combines performance, safety and the legendary build quality of Morris Yachts. Equally capable of blue water cruising and easy daysailing, the GALENA II is a beautiful example of the model. Hull is foam core construction with a continuous Kevlar/E glass laminate layer in both the outer and inner skin utilizing Hydrex vinylester resin. Port and starboard longitudinal outboard girders and bilge stringers. Deck is permanently bonded to the hull with 3M 5200 marine adhesive and through-bolted. Structural bulkheads are marine grade plywood glassed to the hull and deck. Non-structural joiner panels are Lite-Ply. Stringers and Floors are of foam cored GRP construction reinforced with unidirectional fabrics. Integral fiberglass stub with external lead ballast. Spade- rudder with carbon fiber post, upper and lower self-aligning bearings. SS emergency tiller. PVC rub rail painted to match hull with SS half oval. Deck is foam core construction reinforced with unidirectional fibers and the flange is solid fiberglass where it attaches to the hull. Standard core material is replaced by high-density foam where fasteners are required. Forepeak storage area separate from forward cabin by watertight bulkhead. Folding step for access and electric bilge to keep sump area dry. (4) Fiberglass dorade boxes with hood SS cowl vents, screens, and Morris Yachts closures. Each box has a custom SS guard. (10) Hood opening glass portlights thru the cabin side in the cockpit (all with screens). Large flush deck fiberglass foredeck hatch with molded gutters to access chain locker forward of watertight bulkhead. (3) Flush mounted fiberglass sail locker hatches in the cockpit with SS hinges and hasps. Acrylic sliding companionway hatch on brass slides. Hatch is fitted with custom SS locking latch. A removable screen is standard. Vented propane locker dedicated for storage of three 10lb propane cylinders is located in the port lazarette locker. Pilothouse has (4) bent glass windows port and starboard and (3) flat glass windows forward made from laminated safety glass with low E option. Stern rail extends forward to the boarding gate and has integrated attachment points for the Bimini. Stern light bracket and 1.25” flag socket are welded to stern rail. Raised SS arch is integrated with the stern rail for mounting radar, GPS, VHF and TV antennas. Forespar Davits mounted at transom with 4x1 hoist. (2) Piece SS folding ladder with PVC treads at transom swim platform for easy access from water. Stainless steel hand rails on the cabin top. Varnished teak toe rails with custom stainless steel cast chocks integrated into toe rail. SS deck fills with integral folding levers for all fuel, water and holding tanks. (2) SS 12” Spartan Blue Water forward cleats. (2) SS 10” Spartan Blue Water midship cleats. (2) SS 12” Spartan Blue Water aft cleats. Electric Lewmar Ocean 1 windlass on foredeck with gypsy for 5/16 HT chain. Nylon strap jacklines for each side deck and two straps are included for the cockpit. The large, ergonomic cockpit is set up for comfortable cruising and easy sail handling and features a custom hard dodger that integrates seamlessly with the raised salon. Fiberglass hard dodger with side and front windows and center companionway slide for additional headroom when needed. Dodger features two opening front windows for ventilation and two overhead dome lights. Canvas cockpit Bimini fitted to SS folding bows attached to the stern rail with large center window and canvas storage boot and a filler piece to connect to dodger. Teak drop boards with canvas storage bag. Edson Classic 401 pedestal with through shaft wheel brake, single lever control, SS guard and 54” Diamond series aluminum wheel with leather Comfort grip cover. Ritchie 6” Globemaster with SS hood mounted on steering pedestal. (2) Flush 1 ½” flush cockpit drains plumbed directly overboard. Scandvik cockpit shower in a box mounted on the starboard side of the transom. Contains a single lever hot and cold mixer and pullout shower head with 6ft hose. Teak cockpit table with two folding leaves mounted with an Edson bracket to the pedestal guard. A fleece lined canvas storage bag is provided to protect the table when not in use. The interior is laid out with a large master cabin forward with a double berth and in suite head. Aft of the master cabin is a comfortable U-shaped dinette with a settee and pilot berth opposite to starboard. The galley is a step up under the raised salon section aft of the dinette with the nav station conveniently located opposite. A second double berth cabin is located at the base of the companionway to port and a large aft head with separate shower. A door through the shower gives access to a work room with washer/dryer that can also be accessed by hatch in cockpit. The interior is Herreshoff style with antique white Pionite bulkheads and contrasting varnished Honduras mahogany trim with a gloss varnish on the majority of the interior. Oiled teak is used in the heads and showers. The teak and holly cabin sole is finished in satin varnish and, with the exception of (12) Lift-out panels, is fastened to the floor timbers with SS screws set in brass screw cups for easy removal. The lift-out panels are secured with latches and located to provide quick access to the bilge. Overhead finished with white v-groove panels secured with varnished mahogany battens and are removable for access to wiring and deck above. Overhead hatches incorporate retractable screens and shades. Pull down retractable shades over portlights. Oceanair pleated retractable sun shades for raised salon windows. Hull sheathing in varnished mahogany. Interior lockers lined with cork. Companionway ladder is mahogany with teak treads. Large double berth offset to port with drawers below and seat to starboard. Shelf with a 2” fiddle on the port side above the berth. Overhead storage lockers to starboard with sliding doors. Hanging locker has a fiddled shelf and cork insulation on the hull. Starboard bureau with countertop and locker above and two drawers with a drop front below. The hull is clad with mahogany sheathing. High-pressure laminate-covered bulkheads with teak trim and Pionite countertop. Scandvik bulkhead mount shower. Includes Scanmix faucet with thermostatic mixer control for constant temperature. Vanity with Scandvik SS mirror polished oval sink and mixer faucet. Electric marine toilet with outboard storage cabinet and a shelf. Toilet paper holder, SS towel bar, soap dispenser and bulkhead mirror. Acrylic bi-fold shower panels fold flat against bulkheads. Secure U-shaped galley to port in the raised salon area. Corian countertops with mahogany fiddles. Outboard storage locker with sliding doors. Scandvik SS polished under mounted double bowl sink. Includes a single lever faucet and pullout spray rinse. Seagull water filter with faucet. Trash bin attached to a swing out door below. Sponge storage tray, two drawers, one with a silverware tray, lift top storage bin outboard of the sink and a pot locker below stove. A paper towel holder is bulkhead-mounted aft of the sink. Icebox is approximately 10.5 cubic feet and located at the forward end of the galley. Fiberglass ice box divided into refrigerator and freezer compartments with separate top loading hatches, adjustable shelves and separate front loading door. 12 volt DC refrigeration with individual controls for each box. Two evaporator plates in freezer and one in refrigerator. Molded large capacity fiberglass box with divider, separate top-loading hatches, adjustable shelves and 4” of insulation. Force 10 three-burner propane stove with thermostatically controlled oven and broiler and stainless steel crash bar. Grohe soap dispenser mounted through the countertop. GE 600 watt microwave oven in galley outboard cabinet. Varnished mahogany paper towel holder. Storage under counter and in lockers outboard. Custom dish locker with storage for dishes and wine glasses. U-shaped dinette to port with large fixed drop leaf dining table with storage bin and drawer one step down from the galley and raised salon area. (3) Lockers outboard above the seat backs. Single center seat to starboard with pilot berth above and storage lockers forward and aft of the seat. Starboard chain plate is boxed in with a flat screen TV mounted to the aft face with a hinged bracket. Fixed hull portlight on the starboard side. Mahogany bookshelf on forward bulkhead. Storage in drawers and shelf at forward end of settee opposite dinette. Forward facing navigation station with opening top for chart storage. Electrical panels for 12-Volt and 110-Volt systems are mounted in a locker outboard. Shelving and angled corner cabinet for mounting electronics. Double quarterberth is offset to port with one shelf outboard. Hanging locker lined with cork insulation on the hull. Bureau aft of hanging locker with two drawers, foot locker and a countertop locker. Chart storage locker in overhead over berth. High-pressure laminate-covered bulkheads and countertop. Varnished teak trim in the head. Oiled teak trim in the shower. Vanity with Scandvik SS mirror polished oval sink with Grohe pullout mixer faucet and locker below. Large locker outboard of the electric marine toilet with a single shelf and a pair of single panel sliding doors. Wood frame mirror, toilet paper holder, soap dispenser, toothbrush and cup holder and SS towel bar. Starboard sail locker and work room can be accessed through the shower stall or via the cockpit seat hatch. Work bench with tool chest and storage with folding seat. Single-lever throttle and shift control pedestal. Water pump is fitted with Speedseal cover for easy access to the impeller. 3 Blade Flex-O-Fold 18” folding propeller. (3) aluminum fuel tanks with total capacity of 110 gallons. Dual Racor 500 filter system with vacuum gauges. Reverso reversible oil change pump. All below waterline fittings double-clamped. All clamps are 316 SS. Sidepower SP95T 8 HP tunnel bow thruster with joystick control at helm. Mastervolt Whisper 3500 4KW generator with sound enclosure. Espar D5L diesel heater with 5 adjustable vents. Electric marine toilets in both heads. (2) 25 gallon polyethylene tanks with external level monitors and overboard vents. Tanks can be emptied overboard through a seacock and discharge pump or by deck pump out. (2) Separate shower sump tanks discharged overboard by Whale diaphragm pumps. Refrigerator and freezer will drain into the aft sump tank. (3) SS tanks with a total capacity of 120 gallons. Manual pumps for fresh water at galley and head sinks. Stainless Steel 10-gallon capacity hot water tank heated by engine or 110 Volt AV power. Seagull water filter at galley sink. Spectra Ventura water maker with MPC control and Spectra Z-Branes system. Sea Frost 12v DC refrigeration system for freezer and refrigerator with separate electronic controls for freezer and refrigerator. ShurFlo raw water deck wash system with spigot on foredeck and fresh water tee valve. Thru-hulls above waterline are fiberglass tube. All seacock and thru-hull openings are flush with the hull surface. Centroid Computank electronic gauge system for water and fuel tanks. Snake River holding tank level monitors. (2) Electric Johnson 2200 bilge pumps with Paragon Ultra Safety Systems float switch (one in main bilge and one in forepeak). Mastervolt custom layout panel with AC and DC breakers, digital meters for AC and DC loads, controls for inverter/charger and generator and remote battery switches. Battery parallel switch for emergency starting. Electrical panel mounted in hinged mahogany frame allowing easy access to wiring and fuses behind panel. Amptech 140 Amp 12-Volt alternator. 30 amp shorepower inlet and shorepower cord. Mastervolt 2500-Watt inverter with built-in 100 amp charger and remote control panel. Mastervolt Batter Watch battery monitor. Solar panels on hard dodger and bimini frame. AC outlets in the galley, aft head, forward cabin, main salon, aft cabin. DC outlets in cockpit winch pocket and nav station. Navigation lights including running lights, stern light, combo steaming and foredeck light, spreader lights and tri-color anchor light. Swivel reading lights, dome lights, and rod lights throughout boat. Courtesy light at the base of the companionway ladder. Combination white and red gooseneck chart light. Switches are mounted on most lights. Remote switches are provided for the galley spot light, courtesy light and the light in the shower. Jabsco flex mount engine blower and switch. Copper bonding strap for ground and lightning protection. Additional 3” copper strap glassed onto hull to create ground plane for possible future installation of SSB antenna tuner. Raymarine RL80RC chartplotter/radar at nav station. Raymarine RL80C chartplotter/radar display at helm. Icom M502 VHF with two antennas – one on mast head and backup on instrument arch. Icom HM-127 Commandmic at helm. Icom M802 SSB with AT140 tuner. Raymarine ST60 instruments for depth, speed, wind and compass mounted at seahood. Raymarine ST60 Multi instrument displays at helm and nav station. Raymarine ST7001 autopilot control at helm. Raymarine ST6001 autopilot control at nav station. Raymarine Smart Controller wireless autopilot handheld control. Masthead cell phone antenna run to nav station. WatchMate Vision AIS at nav station with external antenna. Alpine AM/FM/CD stereo with XM satellite radio and hookup for ipod/pad/phone. One pair of Sonance flush mount speakers in main saloon bulkhead. Alpine waterproof speakers in cockpit. Sharp Aquos 20” LCD flat panel television on swing out door. Shakespeare TV antenna mounted on top of radome. Double spreader carbon fiber mast Awlgripped to match deck. Masthead setup with two main halyard sheaves, two genoa halyard sheaves, topping lift sheave and two wing halyard sheaves with SS guards for the spinnaker and code zero. Spartite mast wedge with rubber boot and canvas cover. Removable inner forestay setup with double sheave box and Dyneema stay and running backstays with removable tails. Leisurefurl aluminum boom with external preventer led aft on the cabin top to a rope clutch on the starboard side of the companionway. Awlgrip to match mast. Preventer on boom led aft to rope clutch on cabin top. Navtec System 50 hydraulic boom vang and backstay adjuster. Harken Big Boat track and car traveler located on cabin top forward of the dodger. Traveler control lines with 4:1 purchase are led to cockpit and secured in cam cleats mounted at the aft end of the trunk cabin. Double-ended mainsheet system is led to the starboard cabin top winch and the starboard cockpit secondary winch. Harken Big Boat Genoa tracks with adjustable line control cars. Control lines are led aft to rope clutches outboard of the cockpit. Masthead crane for VHF antenna and Windex. All running rigging made from New England Rope. Running rigging includes (2) main halyards, (2) jib halyards, (2) staysail halyards, masthead burgee halyard, port & starboard spreader halyards, jib furling line, main sheet, Leisurefurl furling line, two jib sheets, jib car control lines, (2) staysail sheet, running backstays, topping lift, sheets and pennant for asymmetrical and traveler control lines. Harken unit 2.5 jib furling system. Forespar carbon fiber spinnaker pole mounted on mast with sun cover. 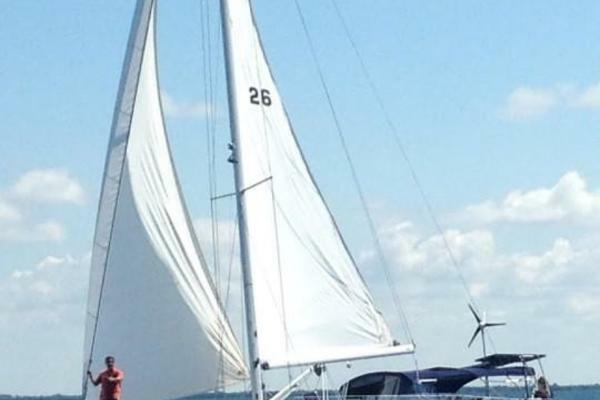 Ullman Sails cruising spinnaker in launching sock. (2) Harken 64 STEC Electric Primaries. (2) Harken 48 STEC Electric Secondaries. (2) Harken 44 STC Halyard winches with stoppers on mast. (1) Harken 48 STEC electric main halyard winch on cabin top under the dodger. Halyard and furling line are led to this winch. Harken 8C snubbing winch located forward of the electric winch to aid in raising and lowering the Leisurefurl mainsail. (1) Harken 48 STEC Electric for Main Sheet. SS double anchor roller built to fit a 66 lb. Bruce anchor on the starboard side. Delta 66lb primary anchor mounted on roller, 150’ of 5/16” HT galvanized chain spliced to 100’ 5/8 3-strand nylon. Secondary Fortress Anchor stowed in forepeak. Bitter end of anchor rode is secured. ShurFlo deck wash-down system with spigot on foredeck. Maxwell low profile electric windlass at stern at port side with Fortress anchor hung on stern rail for stern anchor. Six man Winslow offshore life raft. Achilles 10ft RIB with 5hp Nissan outboard engine. (2) Electric Johnson 2200 bilge pumps with Ultra Safety Systems float switch in the bilge sump and the forepeak. Whale foot pump with folding faucet at galley and head sinks for manual fresh water supply. (3) Kidde Mariner 10 dry chemical fire extinguishers. Mustang throw stick MOB device. (4) Ribbed fenders 10” x 26” with polar fleece covers and lines.